Introduction: In this article, Duncan Kuehn provides some newspaper search tips for genealogists, especially regarding locations. Duncan is a professional genealogist with over eight years of client experience. She has worked on several well-known projects, such as “Who Do You Think You Are?” and researching President Barack Obama’s ancestry. Typically when we do genealogical research we go straight to the local jurisdiction, which is often at the county level. We get vital records, land deeds, and tax lists on a county level. Although the federal census is conducted nationwide, we can search it on a county or even city level. As genealogists, we tend to narrow our focus down to the smallest jurisdictional unit. This is typically a very effective strategy. However, this local focus is not always the best approach when searching newspapers. If you took your local newspaper and organized all the articles in it by the location of the event being reported, you would find that the majority of the news comes from outside of the city, county or even state where the paper was published. This has been true throughout history. When searching for information in newspapers, I begin my searches by looking nationwide. But if I get too many search results, I then narrow my search by using date ranges and specific locations. Here’s how I approach searching for family history information in newspapers. First, I begin my search with just the first and last name. Then I narrow the search by date range if I get too many results. Once I have searched with this criteria and I am still getting too many results, I narrow further by using the city or state name as a keyword. It is important to keep in mind that GenealogyBank’s search engine is very specific and will only search for exactly what you type. This helpful feature prevents you from getting too many unrelated results back. But it also means that you have to be creative in what you enter in the search box. This applies to the names and keywords fields. When I am searching nationwide for an article from San Francisco, California, there are a variety of keywords I could use: California, Calif, CA, San Francisco, San Fran, SF. Use Quotations for Phrases: Whenever you enter a group of words that you want to find together, such as “San Francisco,” put the group in quotation marks. Start Broad Then Refine: The default setting on GenealogyBank already searches nationwide for you. There is the option to select a state from the map at the bottom of the results page. However, doing so will often eliminate many of the newspaper articles you are looking for. Therefore, I recommend doing a nationwide search first and then, if necessary, using keywords such as the city or state name to narrow your results. Explore Articles from Multiple States: Keep in mind as you look through the search results page that the location listed is the location of the newspaper and not the location of the article. Don’t hesitate to click on any newspaper article that looks like it might be relevant even if its listed location appears to be several states away from where your ancestor lived. Use Keywords: You can add a series of keywords into the “Include Keywords” box. Keep in mind that adding too many keywords all at once may not be an effective research strategy. Add them one at a time until you get down to a reasonable number of results to search, around 100-200. Exclude Keywords: You can also use the “Exclude Keywords” box to narrow results. Let’s say you were searching for a man named Eric Clapton, but you weren’t looking for the musician. Glance through the results and find words that often appear in articles about the musician. These may be things like: album, concert, or guitar. Enter those words into the “Exclude Keywords” box as follows: album OR concert OR guitar. This eliminates articles with those words. Some genealogists may think that the person they are looking for was a poor farmer from a small town who would never have made the national news. You would be surprised what articles got picked up and how far away they went! I’ve included several examples in this Blog article to prove this point. Today it is less likely that small town news will travel nationwide, but the further back in history you go the more likely it is that local news could be published in distant newspapers. Where’s My Ancestor in the News? Keep in mind that local news articles can be published in any newspaper in the nation, in places where you might not logically think to look. Your ancestor may not have ever visited the area where the news was published. They may not have any friends or relatives residing in that location. Newspapers subscribed to other papers and published their articles if they thought the news would be interesting to their own readers. There were no copyright laws to stop them from republishing word for word—or even from embellishing—what was originally published elsewhere. Newspaper editors would also select news articles from other papers simply because they fit the space their paper had available. In the past, newspapers were the main form of mass communication, predating other social media like radio, TV, Facebook and Twitter. When families moved from one place to another, they would often keep their subscription to their hometown newspaper. If many people migrated from a certain location, the local paper in their new area would regularly run articles from their place of origin in order to cater to those readers. Reading the newspaper and talking over the events was a highlight of a community’s week. Before TV, this was a common form of entertainment. Human nature is always looking for new and exciting experiences. This fact keep editors busy scouring other papers for information to republish. For genealogy researchers, this gives us multiple opportunities to find the articles we are searching for, even if the original newspaper’s archives no longer exist! Here is a great example of that. I once had a genealogist ask for help finding a photograph of one of her relatives that had appeared in the local newspaper in Allentown, Pennsylvania. She had looked through GenealogyBank’s collection of Pennsylvania newspapers and hadn’t been able to find the photo. I started by using just her ancestor’s last name because it was uncommon. I did not put any additional information in the search box. We found several copies of the photograph that had been published in newspapers all across the nation (Illinois, Massachusetts, Tennessee and North Carolina) and she was able to select the best copy for her records. 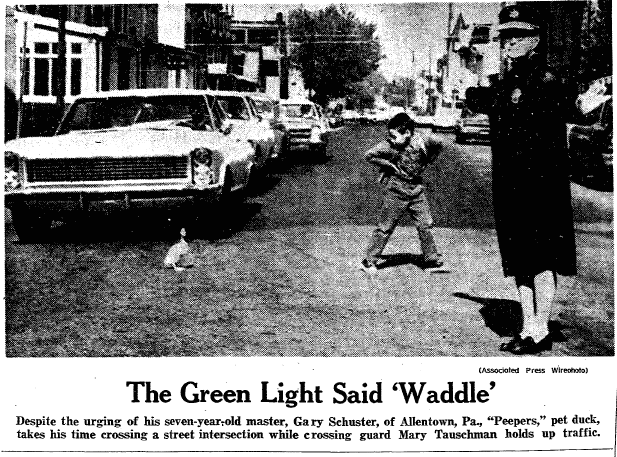 Here is a photo of her ancestor Mary Tauschman helping a pet duck cross the road, published in a Massachusetts newspaper. 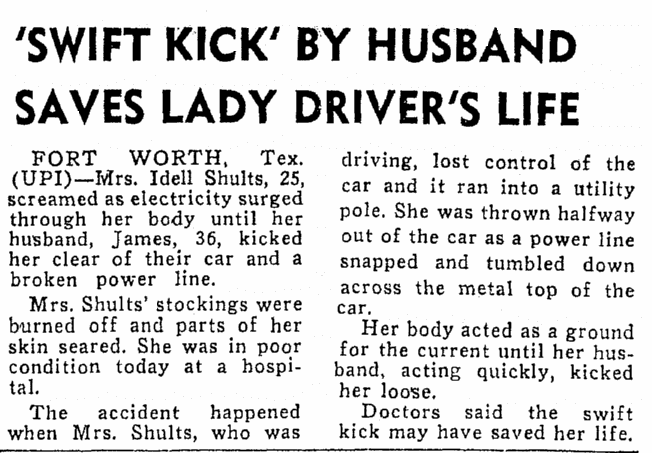 Another time, I helped a genealogist who was searching for a report of her relative’s car accident in Forth Worth, Texas. We were able to find the article all the way up in a Massachusetts newspaper! Her ancestor’s accident was indeed horrible—thank goodness for the quick action by her husband! Here is another example. 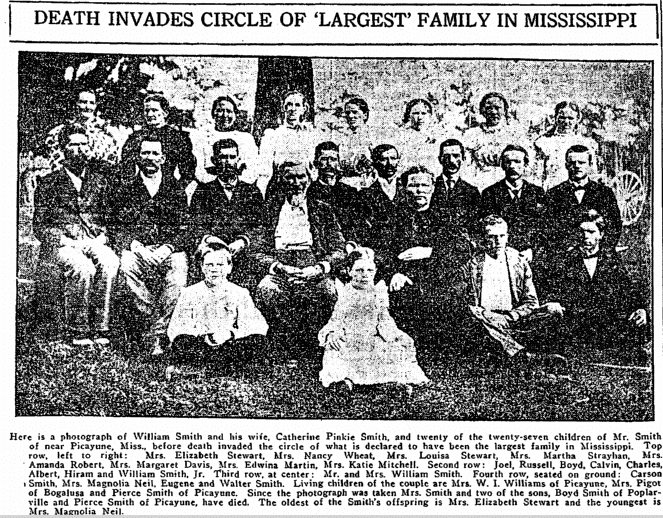 A large Mississippi family is photographed and named individually, but the photo appears in a Louisiana newspaper. There is also the example I gave in a previous GenealogyBank Blog post about the death notice of my ancestor Zachariah Nicholson (see: Genealogy Records: A History of Regional Coverage in the U.S.). There is no reason this farmer’s death in Indiana would appear in a Michigan newspaper—yet here it is. Here is one more example: an announcement for a marriage in Omaha City, Nebraska, that is appearing in a Georgia newspaper. Genealogy Search Tip: Start your newspaper search without a location, searching nationwide because you never know what paper published an article about your ancestor. If you get too many search results, start narrowing your search by using the state or city name as a keyword. What do you suggest if the person’s last name is the same as the name of a city/town, thus giving many hits related to the place, not the person? I’ve tried narrowing to his location. Name: William Reginald Richardson, born 1887 Atlanta, Cass County, Texas. Married 1908 Arkansas. Looking in genealogybank for traces of his family. I already have documents and info of him after marriage. I don’t know his parents or siblings. I do know his father was George, from England. Can’t find George Richardson in newspapers either. This is an excellent question Audra. You could try using the state name in the Exclude Keyword field, if you find that the articles also mention the state name. This usually works well as long as your ancestor didn’t live in that state as well. This problem also occures when the name is also a common word like the last names Snow, Rice, or Walls. When you encounter this situation, I recommend entering the entire name in the last name field. It would look like this. Last Name: “James Snow”. Entering the information like this will search for the name as an exact phase instead of parts, thereby eliminating snow banks and snow storms. In your case, you would enter variations of the name entirely in the last name field. Try using some of these variations: Wm Richardson, William Richardson, W R Richardson, Reginald Richardson, and William Reginald Richardson. You need to run several searches because it is looking for the exact phrase. The typical first and last name search will allow a few words between the names to catch situations like William and Sarah Richardson or William R C Richardson when you search for just William Richardson. Generally this is an excellent way to search but in situations like this you now have other tools to use. Best of luck in your search!